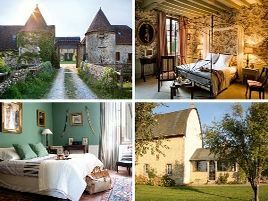 This old fortified farmhouse, surrounded by moats, is located in the Perche Natural Park. At the entrance stand two majestic pepperbox watchtowers with their loophole openings, dating from the start of the 15th century. Heated, outdoor swimming pool (open from May to September) and wellbeing services (with reservation). The original charm of the site has been well preserved: the rooms within the large barn (the main farm building) are spacious and comfortable, stylishly decorated to complement the exposed wooden beams, stone walls and brick floors. Various meal options are offered including Sunday brunch. A relaxed yet attentive welcome. .
- massage, stage de yoga. - atelier de cuisine. - practice de pêche sur place et pêche dans l'étang de Rouge à 8 km. - golf à 12 km. 5 rooms with bath, WC and TV. From 110 to 150 euros (2 pers.). Extra bed 40 euros. 1 gîte also for rent. Baby equipment, babysitting, games, children's meals. Two family rooms. The closest station is Verneuil-sur-Seine, located at 8 km.